Apollo Bay is a coastal town in southwestern Victoria, Australia. Get in touch with nature at Port Campbell National Park and Loch Ard Gorge. Step off the beaten path and head to Red Rock and High on Heels. Step out of Apollo Bay with an excursion to The Razorback in Port Campbell--about 1h 10 min away. And it doesn't end there: take a peaceful walk through Mait's Rest, trek along Great Ocean Walk, take some stellar pictures from Mariners Lookout, and play a few rounds at Apollo Bay Golf Club. To see photos, more things to do, other places to visit, and more tourist information, you can read our Apollo Bay driving holiday planner . Singapore, Singapore to Apollo Bay is an approximately 15-hour flight. The time zone difference moving from Singapore Time to Australian Eastern Standard Time (Victoria) is 2 hours. Wrap up your sightseeing on the 22nd (Wed) early enough to travel to Portland. Portland is a city in Victoria, Australia, and is the oldest European settlement in the state. Kick off your visit on the 23rd (Thu): see the interesting displays at Portland Powerhouse Motor and Car Museum, stop by Portland Strawberries, then learn about all things military at World War II Memorial Lookout, then enjoy the sea views from Whaler's Bluff Lighthouse, and finally take in nature's colorful creations at Portland Botanical Gardens. Here are some ideas for day two: look for all kinds of wild species at Cape Nelson State Park, then enjoy the sea views from Cape Nelson lighthouse, and then take some stellar pictures from Point Danger Gannet Colony. For more things to do, traveler tips, maps, and other tourist information, read our Portland day trip planning tool . You can drive from Apollo Bay to Portland in 4 hours. Expect a daytime high around 19°C in May, and nighttime lows around 9°C. Finish your sightseeing early on the 24th (Fri) to allow enough time to drive to Warrnambool. Warrnambool is a regional centre and former port city on the south-western coast of Victoria, Australia. Griffiths Island Lighthouse and Tower Hill Cemetery are good opportunities to explore the local culture. Get outdoors at Port Campbell precinct and foreshore and The Arch. 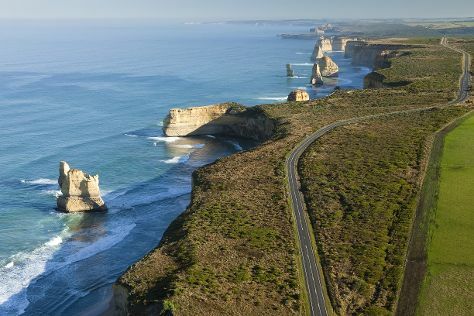 Change things up with these side-trips from Warrnambool: Port Fairy (Russell Clark Reserve & Wishart Gallery) and Port Campbell (Gibsons Steps & London Bridge). The adventure continues: look for all kinds of wild species at Thunder point Coastal Reserve, tour the pleasant surroundings at Logan's Beach, take in the exciting artwork at Whale Bone Studio Arts, and step off the mainland to explore Griffiths Island. Plan my Warrnambool trip by asking Inpirock to come up with tips and suggestions. Getting from Portland to Warrnambool by car takes about 1.5 hours. Wrap up your sightseeing on the 29th (Wed) to allow time to travel to Aireys Inlet. Aireys Inlet is a small coastal inlet and town located on the Great Ocean Road, southwest of Melbourne, Victoria, Australia. Take a break from the city and head to The Great Ocean Road and Lorne Beach. Get some cultural insight at Qdos Arts Gallery and Great Ocean Road Story. Explore Aireys Inlet's surroundings by going to Lorne (Erskine Falls & Sheoak Falls). And it doesn't end there: enjoy the sea views from Split Point Lighthouse, look for gifts at Great Escape Books, and don't miss a visit to Teddy's Lookout. Plan a trip to Aireys Inlet easily and quickly by telling Inspirock to suggest an itinerary. Traveling by car from Warrnambool to Aireys Inlet takes 2.5 hours. Expect a daytime high around 20°C in May, and nighttime lows around 8°C. You'll have a few hours on the 2nd (Sun) to wrap things up before traveling home.